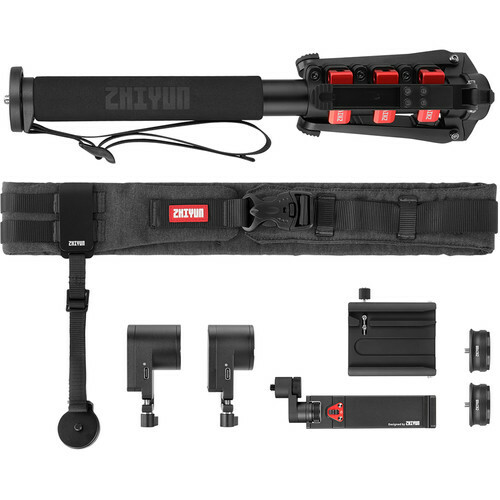 This Zhiyun-Tech Crane 3 Lab Creator Accessories Kit has everything you need to get started with your Zhiyun Crane 3 Lab gimbal. It consists of a smartphone holder, focus and zoom combo kit, a small handheld tripod, a large multifunctional camera belt, a quick setup kit, and a quick release baseplate. The articulating smartphone holder secures phones up to 6.3" wide to the Crane 3 Lab, and it folds up when not in use. The quick setup kit consists of two adapters that allow you to put together and break down your gimbal quickly, rather than screwing the joints together. The handheld tripod is a compact tripod that can also be used as a handgrip on the top or bottom of your Crane 3 Lab when folded up. The large camera belt allows you to conveniently mount various accessories to keep your hands free and offers additional support for your Crane 3 Lab. The quick release baseplate can attach to the camera belt or tripod to allow for quick camera changes to and from the Crane 3 Lab. Finally, the focus and zoom combo kit allows you to control your camera's focus and zoom from your smartphone while mounted on the Crane 3 Lab. The Zhiyun-Tech TransMount Crane 3-Lab Handheld Tripod is a replacement mini tripod that attaches to the bottom of the Crane 3-Lab gimbal. Box Dimensions (LxWxH) 7.6 x 2.1 x 2.0"